Recycling is a method of reusing materials that would otherwise be disposed of in a landfill or incinerator. Household products that contain glass, aluminum, paper, and plastic are used for recycling and to make new products. Recycling has many benefits: it saves money in production and energy costs, helps save the environment from the impacts of extracting and processing virgin (never used; not altered by human activity) materials, and means that there is less trash that needs to be disposed. The concept of recycling is not a new one. At the beginning of the twentieth century, 70 percent of the nation's cities had programs to recycle one or more specific materials. During World War II (1939–45), 25 percent of the waste generated by industrial processes was recycled and reused. Since the general public has become more environmentally conscious, the recycling rate in the United States has risen from 7 percent in 1960 to 17 percent in 1990 to 28 percent in 2000. Analysts predict that by 2005, Americans will be recycling and composting at least 83 tons (75 metric tons) or 35 percent of all municipal waste. Recycling is a three-step process. 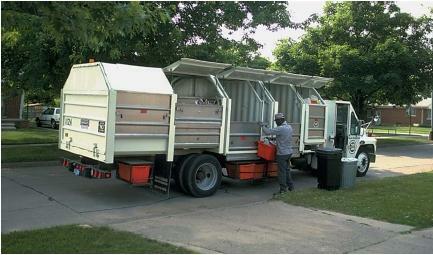 The first step involves collecting and reprocessing materials for recycling. These materials must be separated from other trash and prepared to become new products. Manufacturing of new products from recycled materials is the second step. The final step is the consumer's purchase and use of the recycled product. These steps may appear to constitute a simple and straightforward process, but such is not the case. A number of basic questions have to be resolved before recycling of solid wastes can become a practical reality. Some of these questions are technological. For example, there is currently no known way to recycle certain types of widely used plastics in an economical way. There is no problem in collecting these plastics and separating them from trash, but the process stops there. No one has found a method for re-melting the plastics and then converting them into new products. company is willing to lose money by using recycled, rather than new, materials? One way to expand the use of recycling, of course, is to invent more efficient technologies to deal with waste materials. Another approach, however, is to use the power of government to encourage or even require recycling. Governments are interested in promoting recycling because the cost of other means of solid waste disposal is often very high. If citizens can be made to recycle waste materials rather than to just throw them away, governments can save money on sanitary landfills, incinerators, and other means of waste disposal. 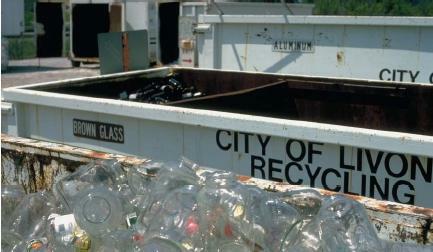 Both the U.S. federal government and individual states have now passed a number of laws relating to recycling. For example, a number of states states (including Arizona, California, Connecticut, Illinois, Maryland, Missouri, North Carolina, Oregon, Rhode Island, Texas, and Wisconsin) and the District of Columbia require that newspapers published in their jurisdictions have a minimum content of recycled fiber. On the federal level, the Environmental Protection Agency (EPA) requires government agencies to set aside a portion of their budgets to buy recycled products. All agencies are required to purchase recycled paper, refined oil, building insulation made with recycled material, and other items that are made from recycled products. Government regulations, however, are not necessarily the best possible answer to developing recycling policies. For one thing, prices are usually higher for recycled products, and there may be problems with availability and quality of recycled goods. Overall, researchers and environmentalists tend to agree that creativity will be the key to solving many of our solid waste disposal problems. Many landfills have reached their carrying capacity. In 1978, there were roughly 14,000 landfills in the United States. By 2000, that number had dropped to just over 5,000. Many of those currently open are expected to be closed within a few years. Fresh Kills Landfill on Staten Island, New York, was the largest landfill in the world. It covered over 2,200 acres (880 hectares) and reached a height taller than the Statue of Liberty. Open in 1948, it was finally closed in March 2001. As we continue to run out of space to put solid waste, recycling, composting, and reusing are fast becoming environmental and economic necessities to help reduce some of that waste. i am all for recycling. how can i do my bit for the environment?? I don't know, but I want to do my part too for the enviroment. i know alot about recycling but i want to learn more. im doing a project about it in school and i want to learn more so please E-mail me back. i definelty believe in recycling, it saves time and energy. and so what if they don't have a solution for re using plastic bottles entirely just yet, it just shows how many people actually care about the environment. Recycling could be compared to harvesting your farm produce and reserving some for next season planting. Definitely,it will ensure continuity. this article is great. It really helped me with my assignment. I'm interested in the content, and can refer back to ther website again. Hello,I am doing a school project could you please e mail me about more of this recycling information? how many times glass can be recycled without alteration. please let me know. thanku.